Pawsitive Impressions: Where are these Pawsitive Impression stories coming from? Where are these Pawsitive Impression stories coming from? A few of you asked where are these pawsitive impression stories coming from? The answer (drum roll, please)… directly from our neighbors! All the letters in italics indicate it is a note directly written by our neighbors in their words. When was the last time you wrote a retailer about your positive shopping experience? We expect it’s probably not that often as many shoppers do not have the time and great service is an expectation. However our neighbors are so impressed that we literally receive a handful each week of how much they love shopping at Pet Supplies Plus. 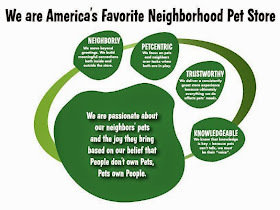 The comments include words like trustworthy, knowledgeable and neighborly…it is no coincidence these are our core behaviors and what makes us America’s Favorite Neighborhood Pet Store.